‘Flower and Trees’ was the first film (animated or not) in full technicolor and it’s therefore a milestone of cinema. Nevertheless, it feels like a transitional film. The colors make it stunningly modern compared to the earlier Silly Symphony entries, but some of the designs still firmly belong to the black-and-white era. The designs of the flowers and the caterpillars, for instance, go all the way back to the third Silly Symphony, ‘Springtime‘ from 1929. The birds, on the other hand, have lost their cartoony designs they still had in ‘The Bird Store‘ from six months earlier, and the villain tree is probably the most elaborate character to have hit the animated screen thus far. For contemporary audiences, the film may seem rather silly and a bit old fashioned, but its storytelling is very economical. It contains some original visual gags (flowers brushing their teeth, a pine portrayed as a hen) and fine drama, when the rejected mean old trees sets the wood on fire. The colors are not only used as a novelty, but add to the drama, as do musical quotes from Franz Schubert’s “Erlkönig” and Gioachino Rossini’s overture to William Tell. Technicolor was a great advancement for the Silly Symphony series. The colors created way more atmosphere and allowed for more complex designs. Because of color, the Silly Symphonies would propel animated art forward like they never did before, making Walt Disney the undisputed leader in the field. This leadership was greatly aided by the exclusive contract Disney concluded with the Technicolor company, giving him the exclusive rights to use the new technique for animated films for three years. So, when other studios had to stick to black and white, or were obliged to use far less convincing two-color techniques, Walt Disney made the most beautiful and literally most colorful cartoons of the 1930s. 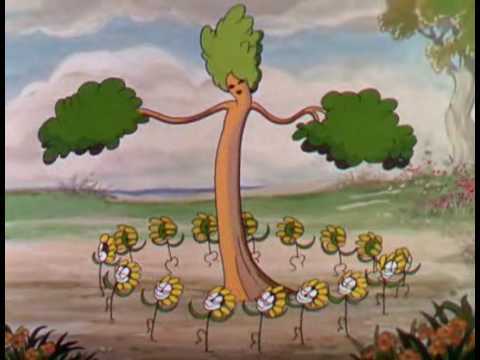 ‘Flowers and Trees’ enthralled the critics so much at the time, they installed a special Academy Award for best animated short films, with ‘Flowers and Trees’ naturally being its first winner. During the 1930s Disney would win every Oscar in this category.